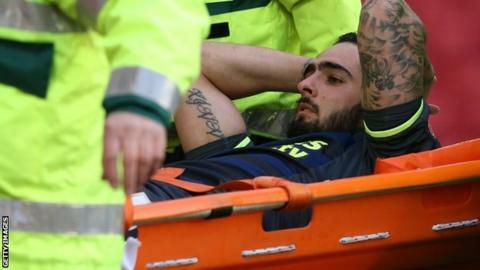 Middlesbrough head coach Aitor Karanka has said he is concerned by the injury picked up by defender Rhys Williams in Saturday's 2-0 FA Cup win at Barnsley. Australia international Williams missed the last 10 months with an Achilles injury, and has also endured pelvic and knee problems during six years at Boro. He returned against Nottingham Forest on Boxing Day but lasted two minutes before he was withdrawn at Oakwell. "I think it's a long term injury," Karanka told BBC Tees. "I'm not sure if it's the same or similar but it's the worst thing today for me - he suffered this for 10 months and I send all my best wishes."